Optimum Opti Seal over wax? So I posted my question a while back in the ask the experts forum but no response so will ask here please. " So four months ago when I purchased a new white car I immediately cleaned it with a chamois, then waxed it with some Mothers paste wax . Yes I have learned a lot since then hopefully. So then I learned about clay bars, bought one and clayed the car. I have never used a hose on the car yet, we also have level 3 water restrictions here so you can only use a bucket anyway. I have never used any carwash soap on the car. I bought a 3.8 lt ( gallon ) of Optimum no rinse wash and wax and a gallon of Meguires X-Press spray wax. ( Blame Darren Priest and Optimum youtube videos) I bought about 50 MF cloths. So I have been only using ONRWW using lots of soaked MF towels and then the Megs spray wax. So now I have learned about and about to buy an 8oz Optimum Opti-seal. So here is my noob question please. Is it OK to apply the Opti-Seal over the ONRWW and the Meguires spray wax??? Will the Opti-seal work down and bond with the paint ok please? I sincerely hope the answer is yes So if its ok , after I apply Opti-seal, I will of course continue rinseless washing the car with ONRWW, and is it ok to at times also use the Megs Xpress spray wax over the Opti-seal? Thanks in advance and regards from North Queensland Australia. " 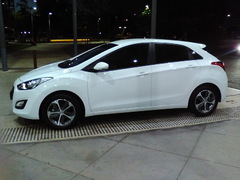 My 4 month old Hyundai i-30 Active X Hatchback. Opti seal over wax ? So four months ago when I purchased a new white car I immediately cleaned it with a chamois, then waxed it with some Mothers paste wax . Yes I have learned a lot since then hopefully. So then I learned about clay bars, bought one and clayed the car. I have never used a hose on the car yet, we also have level 3 water restrictions here so you can only use a bucket anyway. I have never used any carwash soap on the car. I bought a 3.8 lt ( gallon ) of Optimum no rinse wash and wax and a gallon of Meguires X-Press spray wax. ( Blame Darren Priest and Optimum youtube videos) I bought about 50 MF cloths. So I have been only using ONRWW using lots of soaked MF towels and then the Megs spray wax. So now I have learned about and about to buy an 8oz Optimum Opti-seal. So here is my noob question please. Is it OK to apply the Opti-Seal over the ONRWW and the Meguires spray wax??? Will the Opti-seal work down and bond with the paint ok please? I sincerely hope the answer is yes So if its ok , after I apply Opti-seal, I will of course continue rinseless washing the car with ONRWW, and is it ok to at times also use the Megs Xpress spray wax over the Opti-seal? Thanks in advance and regards from North Queensland Australia.